Analytical techniques that provide information on the interactions among biomolecules could help discover the micro- and nanoworlds of biological processes. The majority of biological processes entail a complex interplay among different macromolecules such as proteins, sugars, lipids and nucleotides. To understand and monitor these processes and their impact on tissue physiology, scientists have employed fluorescence imaging techniques. Figure 1 The developed 8x1 time-resolved detection module integrated in a confocal microscope. Fluorescence-lifetime imaging microscopy (FLIM) is a technique that relies on the decay of fluorescence measuring the changes either of the spectral intensity or of the lifetime of the fluorescence. As a result, it could be used to discriminate among different environments and to provide information about the labelled molecules and their interactions. PARAFLUO aims to develop an innovative instrumentation system that enhances and extends the FLIM effectiveness, enabling to obtain simultaneous spectrally resolved data (sFLIM) for the various components of the emission. There is widespread consensus that sFLIM will support a better understanding of the biological processes involved, which may be paramount for the (patho)physiology of tissues and organisms and provide better insight in key medical issues, as origin and growth of tumors. This instrumentation will be useful also in other applications, e.g. multi-spectral profiling of objects by laser detection and ranging. Figure 2(left) Detector head including the SPAD array and the frontend electronics, housed on a round PCB board; (right) Board assembly including all the three parts of the complete module: detector head, power board and output board. 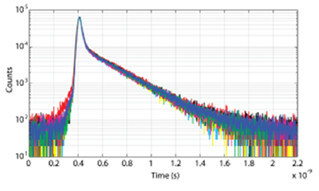 Figure 3 Time response curves of the eight SPAD pixels working in parallel to a narrow laser pulse (<1 ps). A BH SPC 130 was used to collect data. The average FWHM is about 50 ps. (c) the package of the SPAD array detector was designed and fabricated, as well as the other electronic circuits for the detector module. 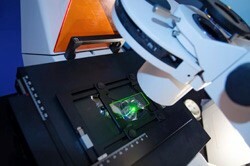 (d) a diffractive microlens array to be integrated with the SPAD array was designed and fabricated. The lens design was aimed at increasing by greater than 100% the light collected by each individual SPAD pixel, compared to that without lens array. Good preliminary results were obtained in the integration of the microlens set with the SPAD array. However, the development of the final package turned out to be more complex than expected for attaining a completely satisfactory performance. Therefore, for avoiding to delay the overall system tests, a suitable alternative detector was assembled by mounting the microlens array onto a high-sensitivity CCD camera. (e) an 8-channel TDC (Time-to-Digital Converter) was designed, employing ultrafast application specific integrated circuits (ASIC). This is capable of processing high photon counting rates (greater than 15 Mc/s) and providing photon-timing jitter better than 20 ps FWHM. The interface circuitry was designed to match the requirements of the PicoQuant HydraHarp hardware and software, looking forward to integrate the new TDC module in this system. Satisfactory performance was experimentally verified. 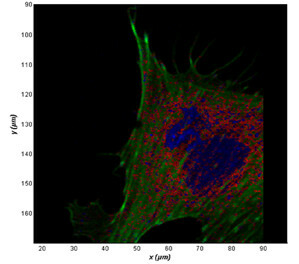 Figure 4 Cell labeled with three dyes of nearly the same fluorescence spectrum (Cy5, Alexa 635, Az 271) but different fluorescent lifetimes. Separation of the components was performed using the measured decay patterns in singly labeled cells. (f) a spectrograph for integration into the imaging confocal microscope coupled to the 8×1 array detector with microlens array was designed, implemented and tested with satisfactory results. Fast efficient algorithms were developed for reducing the huge flow of data produced in sFLIM measurements. A new approach based on moment-analysis of fluorescence decay curves was devised, tested and validated. New software was developed for visualizing data in compressed form. The advanced optoelectronic instrumentation generated by PARAFLUO small businesses will enhance their competitiveness in the European market. From a research viewpoint, it will help to unravel the molecular machines that orchestrate cellular processes and to gain better insight into key medical issues. I. Rech, A. Gulinatti, M. Crotti, C. Cammi, P. Maccagnani, and M. Ghioni, "Towards picosecond array detector for single-photon time-resolved multispot parallel analysis", Journal of Modern Optics, vol. 58, iss. 3 and 4, pp. 233-243, Jan. 2011. A. Gulinatti, I. Rech, M. Assanelli, M. Ghioni, and S. Cova, "A physically based model for evaluating the photon detection efficiency and the temporal response of SPAD detectors", Journal of Modern Optics, vol. 58, iss. 3 and 4, pp. 210-224, Jan. 2011. A. Ingargiola, M. Assanelli, I. Rech, A. Gulinatti, and M. Ghioni, "Avalanche Current Measurements in SPADs by Means of Hot-Carrier Luminescence", Photonics Technology Letters, vol. 23, iss. 18, pp. 1319-1321, Sep. 2011. M. Assanelli, A. Ingargiola, I. Rech, A. Gulinatti, and M. Ghioni, "Photon-Timing Jitter Dependence on Injection Position in Single-Photon Avalanche Diodes", IEEE Journal of Quantum Electronics, vol. 47, iss. 2, pp. 151-159, Feb. 2011. C. Cammi, A. Gulinatti, I. Rech, F. Panzeri, and M. Ghioni, "SPAD Array Module for Multi-Dimensional Photon Timing Applications", Journal of Modern Optics, vol. 59, iss. 2, pp. 131-139, Oct. 2011.